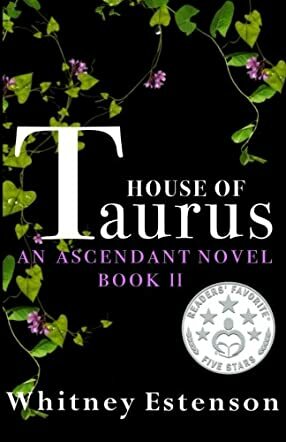 House of Taurus by Whitney Estenson is the second book in the Ascendant series. Kyndal Davenport refuses to believe that Roman is gone for good. She's determined to save him, even if the Council has simply written him off as dead. When the emissary arrives to interrogate them for their involvement in Ezekiel's betrayal, it sparks a chain of events that brings Kyndal face to face with the Council. If she has any chance of saving Roman, she has to stand her ground even when she's surrounded by those eager to brand her a traitor. To prove herself, she makes a bold move that, if it fails, could have deadly consequences. Kyndal opens up more of this zodiac inspired world, and where House of Aries was an introduction to this world, House of Taurus looks closer at the Council and how Kyndal factors into the greater scheme of things. The plot takes a political twist as everyone has their own agenda and everyone seems to refuse to listen to any voice that doesn't agree with their view. The Council especially has their own goals and strict ideals. They have a personality about them as a whole that has a political aspect to how they operate, with Kyndal set as a rule breaker looking to rebel against their every order. It's an important part of her journey to watch her strive to speak out, find her voice, and gain the upper hand against the Council. Kyndal has settled into her powers and is finally learning more about her connection to Roman through the history of the houses. She's constantly having to prove herself and, by digging into the past, she learns more about not just the present but the future. Everything she learns seems to tie into how everything ends up unfolding. Whitney Estenson brilliantly weaves history into the larger plot as the events lead to unexpected results. In many ways, Roman and Kyndal's love story is a tale of heartbreak more than a romance as she struggles to save him after he's been possessed. In a brilliant sequel, Estenson opens up the characters more, quickly showing loyalty and all its virtue through the various relationships in Kyndal's life and in her search for allies. A heart-pounding adventure from beginning to end, House of Taurus is a tale of love and betrayal as Kyndal fights for a destiny of her own while also fighting against the path laid out for her. I've never even read the book but Whitney Estenson is my teacher so I'm going to rate it 5/5.